Experienced yo-yo dieters may be interested to learn that when one eats the right foods, one can actually eat more, weigh less and maintain a healthy body weight. While for decades calorie counting was recommended for weight loss, it appears that advice is passé, as diets that focus solely on calorie counts generally ignore the nutritional value of food. A diet low in nutrients can leave one feeling hungry and dissatisfied and is unsustainable long-term. An easier, more efficient, and healthier way to lose and maintain a proper weight is to place emphasize on the energy density of foods. 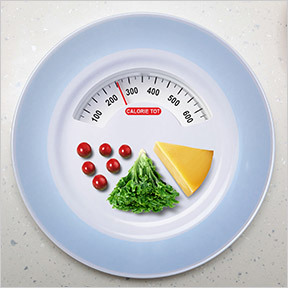 Energy density is the amount of energy (or calories) per gram that each food contains. Low-energy dense foods provide fewer calories per gram, allowing one to have healthy, satisfying portions that keep hunger pangs at bay, while providing the nutrients necessary for good health and function. The energy density of foods is determined by the proportion of macronutrients the food contains. This includes protein, carbohydrate, and fat, as well as water and fiber. Foods that contain larger amounts of fiber and water have low-energy density, while foods high in fat and sugar are energy dense. Low-energy dense foods include high fiber green and colorful vegetables and watery foods like whole fruits and broth-based soups. Nutrient-rich, low-energy dense foods provide vitamins, minerals, antioxidants and phytochemicals. Due to their high fiber content, these foods are filling and satiating, and support healthy weight management. Fried foods, ice cream and bakery goods are high in energy density and provide a large number of calories in relation to serving size. Foods such as nuts, seeds, olives and avocado are energy dense and also nutrient-rich. There’s no need to exclude these healthy foods, but one should keep portion sizes in mind. The healthy fiber content in foods like whole grains and potatoes with skin can also help reduce energy density. Achieving and maintaining a healthy body weight is challenging for many. Scientific data supports the use of diets rich in low-energy dense foods for managing weight. For an equal number of calories, an individual can consume a larger portion of food lower in energy density than a food higher in energy density. As maintaining a proper weight supports a longer healthier lifespan, and provides protection from chronic illness, it pays to put the focus on the nutritional value or satiability of food. A low-energy density, yet highly nutritious diet makes weight management less of a chore and more of a lifestyle habit. Lower the energy density of foods regularly consumed. Main dishes can be reduced by adding extra vegetables, reducing the amount of fat, and increasing water-rich foods. Consume an appetizer low in energy density. Studies show that enjoying a small salad or cup of broth-based soup at the start of a meal can lower the overall caloric intake of a meal, if attention is paid to satiety cues. Research has shown that those who consume a simple garden salad with their meal, generally reduce their overall consumption by approximately 100 calories. Add extra vegetables, beans or pulses to main dishes to provide additional nutrients, fiber and protein. At least half of one’s plate should be filled with vegetables. Reserve one quarter for protein and fill the remaining quarter with starchy foods or fruit. Choose foods with a high water content. While increased water consumption may or may not control hunger, studies show that consuming foods with a high water content significantly increases satiety and reduces the caloric intake of the meal. This includes soups and stews where water is added during cooking, in addition to foods with a naturally high water content. Avoid large portions of foods high in energy density. Studies show that even modest reductions in portion size can have a beneficial impact on energy intake. Preparing or consuming foods without added fats and sugars, such as substituting grilled chicken for fried and choosing fresh fruit over sweetened canned fruit, will considerably lower energy density. Choose dessert carefully. If you’re craving something sweet, end the meal with a bowl of delicious fresh berries, rather than high density sugary foods. If you really want ice cream or other high calorie foods, stick to one small serving to keep the caloric intake in check. This entry was posted in Home and tagged Eat More, Food Energy Density and Weight. Bookmark the permalink.